Dress your decor with desirable handmade accessories. 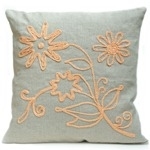 Using luxury natural fabrics and materials, each cushion is unique and carefully stitched and crocheted. Designed as limited editions, these home accessories will add a beautiful accent to your home.